This chronometer has a classic French spring-driven, two-day movement between circular plates with Earnshaw spring detent escapement and cut bimetallic balance with adjustment screws in the rim and blued-steel helical spring. It has a chain fusee and maintaining power. The backplate is signed and numbered in the following manner: VISSIÈRE No. 248. 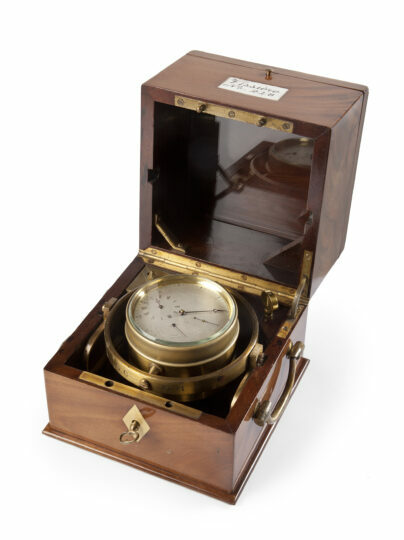 The movement of this chronometer is situated in a gimballed brass bowl in a three-tier mahogany case with two external brass carrying handles to the sides. The winding key which cannot be turned in the wrong direction finds itself in the right-.hand top corner. In the left-hand top corner is a slide to secure the gimbals for transport. 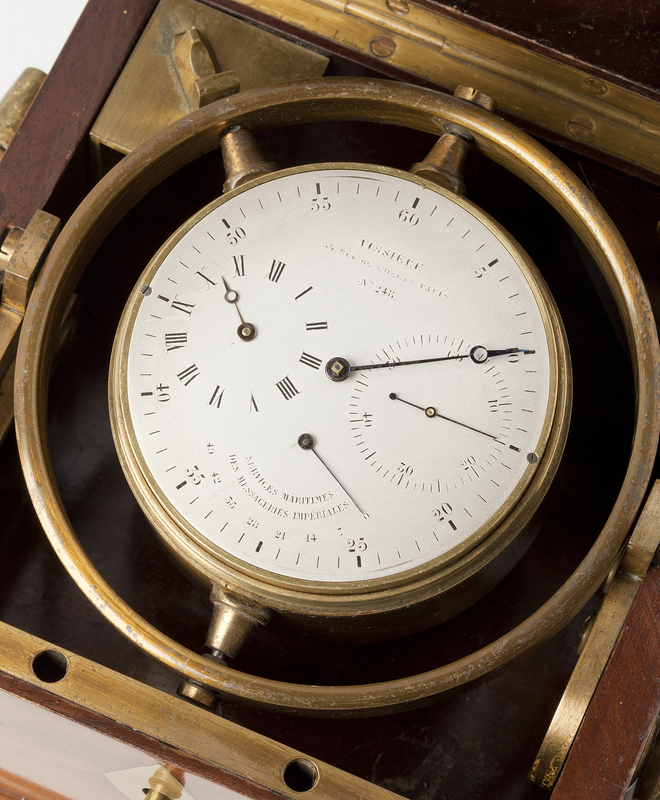 The top lid allows reading the time through the top window with having to open the case itself. There is a rectangular ivory plaque countersunk in the front of the upper part of the case which is inscribed as follows Vissière No. 248. 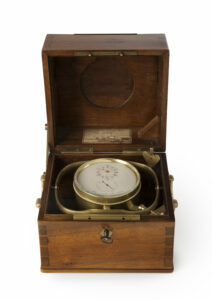 The top of the case has a brass plaque with the number of the clock: No. 248. Dimensions: 17 x 16 x 16 cm. T. Mercer, Chronometer makers of the World, London, 2004, p. 249; Tardy, Dictionnaire des Horlogers Français, Paris, 1971, p. 645; H.M. Vehmeyer, Clocks, Their Origin and Development 1320-1880, Gent, 2004, p. 910-911, 1000. Simon Vissière was born in Paris in 1822 and died in Cannets in 1887. He was apprenticed to Joseph Winnerl in Paris and specialised in the study of magnetism and its influence on the balance spring. In Le Havre he built a small observatory for private use. He was one of the greatest French chronometer makers and developed a chronometer balance of his own. Many of his chronometers are signed with the place name Paris.